Built 1888-1891 by John Hopkins and Edward Hopkins for Canadian Pacific Railway as an extension to the Hotel Vancouver. Opened 1891. 1200 seats. 1907 major rebuilding and expansion by E. W. Houghton. 1912 severely damaged by fire. 1912 rebuilding and expansion by James J. Donnellan. Later various renamings ("Orpheum", "International Cinema", "Lyric Theatre"). Demolished 1969 in favour of the Pacific Centre Mall. 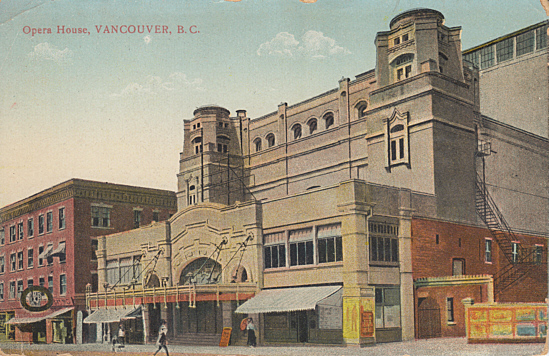 Front Text: "Opera House, Vancouver, B. C."